In 1933, while Chicago was hosting the World's Fair, the Windy City also presented an exposition called A Century of Progress to commemorate Chi Town's centennial celebration. As a part of this celebration, a sports editor at the Chicago Tribune by the name of Arch Ward suggested that the city partner up with Major League Baseball and present a game made up of the best players of the day. Deciding that Ward's idea had merit, team managers and fans made the selection of the players they felt were the era's cream of the crop and, on July 6, Chicago's Comiskey Park hosted what would be the first All-Star Game. With the National League's team managed by John McGraw, and Connie Mack skippering the American League's squad, fans in attendance got to witness the first All-Star homer come in the third inning as none other than Babe Ruth smacked a ball into the park's right field stands. Six innings later, Ruth and the junior league earned bragging rights as baseball's first All-Star champs. Today, every player that participated in that game has gone on to that "big ballpark in the sky" and even the stadium that hosted the inaugural All-Star Game has been gone for over two decades. Few, if any attendees – who would now be in their late-80s and 90s – are still around. And uniforms, bats, balls or any other equipment used in that game would be such rare and prized finds they would be housed in the Baseball Hall of Fame or the Smithsonian Institution. And yet, while most of the flesh and blood, bricks and mortar, leather, horsehide and flannel of that day have been lost to the ages, one of the most fragile and transitory of things to have been within the airspace of Comiskey Park on that day still survives – a ticket. "I can only imagine what it was like to have had a ticket for that game – or for any game in which Babe Ruth played," says vintage ticket collector Rabbi Robert Levine, who up until very recently owned one of the only two full tickets from that first All-Star Game known to exist. "I would look at that ticket and wonder how it ever survived in the shape and condition it is in. Everyone knows what we do with tickets – we stick them in our pockets and they get crumpled up. 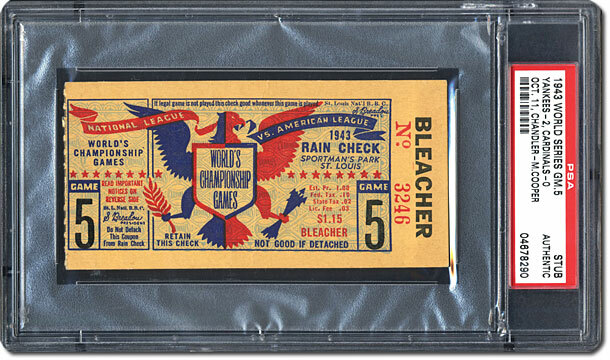 You think of all the baseball memorabilia that has survived in good shape over the years, like cards from the early-1900s that look like they were just made – but a ticket – to me, that's incredible. 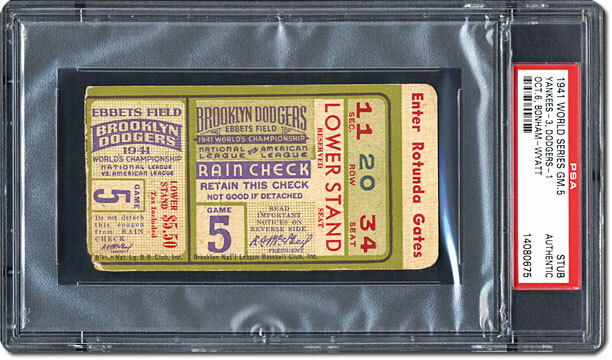 Back in the 1920s and '30s, people were not giving any thought to the fact that the day would come when the ticket that gave them admittance to a game would be a highly coveted collectible. I have no idea how this ticket, and others I own, have ever survived." Many hobbyists feel this full ticket to the first All-Star Game is one of the holy grails of tickets. JP Cohen of Memory Lane Inc., one of the nation's leading dealers of sports collectibles, who recently handled the sale of Levine's first All-Star Game ticket, agrees. "While stubs from that historic day exist, the public sale of a full ticket was a first in the hobby," says Cohen. "It's one of the holy grails of tickets which is why it brought a record price. 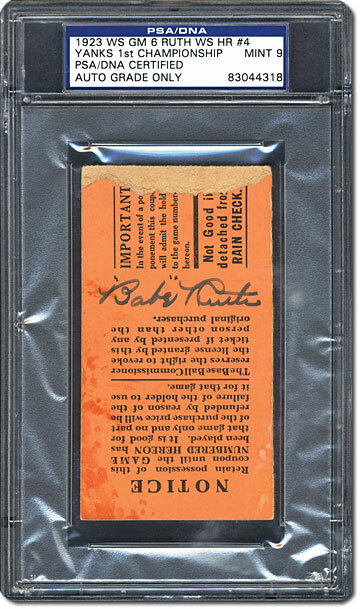 Think about it – this is one of the rarest and toughest tickets you could possibly find, especially in a full ticket, in this kind of condition and authenticated by PSA. It was a game that featured some of the greatest legends of all time – Lou Gehrig and Babe Ruth – so it's like the Honus Wagner card of tickets. There are only two full ticket examples known to exist from that game, and I've seen both of them. It's just amazing that it exists, and we were so proud to have been able to represent and promote it." Cohen, who himself owns a ticket from the game in which Lou Gehrig gave the "Luckiest Man on Earth" speech, says that every ticket tells a story. "It brings that day in history to life," he opines. "It was something tangible that was actually in someone's pocket at that game. 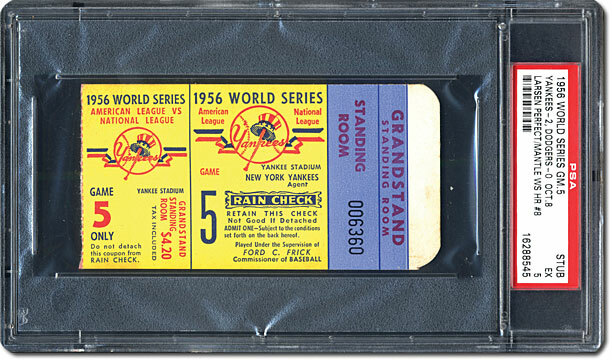 Tickets have great significance with collectors and history buffs. They are a piece of history from stadiums that no longer exist." Robert Levine was ordained at the Hebrew Union College – Jewish Institute of Religion in 1977 and received his doctor of divinity degree in 2002. He is a Phi Beta Kappa graduate of Columbia College, and, in 1997, was recognized as the recipient of the Maria and Joel Finkle Prize as Rabbi of the Year, presented by the New York Board of Rabbis. He has also joined former Israeli Prime Minister Ehud Barak as a recipient of the International Humanitarian Award that is given by The World Union for Progressive Judaism. 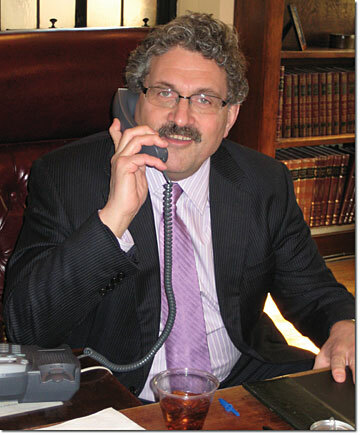 Levine, who has served as the Senior Rabbi of New York's Congregation Rodeph Sholom for the past 20 years, is known to be an inspiring author, speaker, teacher, and counselor to his congregants and community. Renowned by those who know him for his intellect and sense of humor, he has appeared on numerous national radio and television programs and is active in communal affairs. The past-president of the New York Board of Rabbis, Levine has authored three books, "What God Can Do For You Now: For Seekers Who Want to Believe" (Sourcebooks, Inc. 2008), "Where Are You When I Need You? Befriending God When Life Hurts" (HarperSanFrancisco, 1996) and "In There Is No Messiah and You're It: The Stunning Transformation of Judaism's Most Provocative Idea" (Jewish Lights, 2003). While those who have been ministered to and touched by Levine know these things and, that he and his wife of 27 years, Gina, are the parents of three children – Judah, Ezra and Maya, not many know he is also a devout baseball fan who collects memorabilia pertaining to his beloved New York Yankees, vintage tickets, and anything to do with the man he considers to be the most important baseball player of all time – Babe Ruth. Sports Market Report recently caught up with Levine in his New York office where he spoke of his love for America's Pastime and the items pertaining to the game that he has bought, sold and traded over the years. We began our visit by asking him when he first got involved in collecting. Robert Levine (RL): The first things I ever collected were cards – back when I was a kid. My dad ran a grocery store in western Massachusetts where I grew up. He would bring home boxes of Topps cards that he sold in his store and, if we were well-behaved, my mother would give us a pack. I actively collected and traded cards and was always trying to put sets together. I loved busting open packs and still remember desperately trying to find the card of a utility infielder named Mike De La Hoz to complete my 1963 Topps set. RL: Sure. My dad was a big sports fan, so we grew up watching sporting events on television. As for the team I followed – I was always a fan of all the New York teams – the Knicks, the Giants football team and the Yankees. My brother liked the Red Sox so, of course, I liked the Yankees. I came of age during the Mickey Mantle era. He was my favorite player – I really looked up to him. SMR: With no Major League stadium in western Massachusetts, it would have been a real commitment to get to a professional game. Did you ever get that chance as a kid? RL: Well, in my hometown of Springfield, we had a San Francisco Giants Minor League team and my father would take me and my brother to Pynchon Park where we got to watch players who would eventually go on to play in the Major Leagues. But we also did go to some Yankees games. I remember how excited I was going to a stadium with my father. We would drive down to New York for a double-header and our seats were usually high up and obstructed by a pole, but I didn't care, I was just so excited to walk into a stadium – to actually be there. I clearly remember one game in which Whitey Ford pitched. When I think back on that game, or any of the games I went to as a kid, I often do so with my current perspective as a collector. 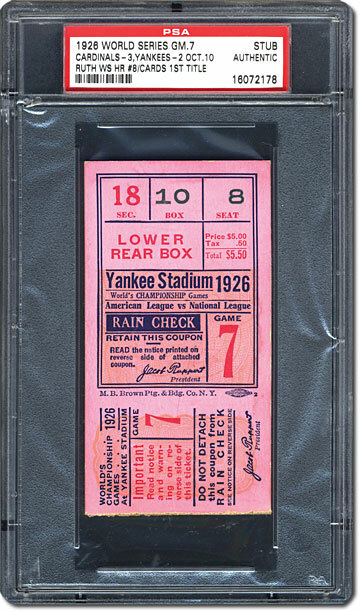 When I was a kid, I would never have thought to keep a ticket stub from the game – certainly not as something that would ever be a collectible. SMR: Did you continue to collect cards as you got older? RL: I had not collected from the time I was about 12-years old until the mid-1990s when the bug came back. When I started collecting again – for the first 10 years – it was nothing but cards. I became a pretty early collector of PSA-graded cards. Like many collectors, I had been victimized by some scam artists with a few purchases. So, when PSA came along, it was a godsend to be able to trust what I was buying. SMR: PSA really changed the hobby and brought a lot of disgruntled collectors back. RL: It certainly made a difference for me. I remember the first PSA card I bought – a 1955 Bowman Mickey Mantle Gem Mint 10. I would not have bought that card had it not been PSA graded. PSA is exceptionally good at what they do. I say that as someone who has met some of the more unsavory characters in the hobby who try to take advantage of people. It is only when you have had a problem that you really realize what PSA has done for the hobby. You quickly come to realize that having cards graded by PSA, or buying PSA graded cards, offers you a value you will get back on the sell side. Buying PSA cards is in every way well worth it. I know for a fact that I would not be collecting with the depth and the fervor I do without PSA. All my tickets are PSA graded. I have come to greatly appreciate the value of card, autograph and pack authenticating and grading, and it's the same for tickets. SMR: Having branched out from just cards to vintage tickets, are you collecting any other items? RL: When I got back into card collecting, I began to expand into collecting autographs, memorabilia and packs. Tickets are my newest thing. I am just a beginner with tickets, so I'm no expert with a huge collection. I just really love them. SMR: What is the attraction to tickets for you? RL: It's the sense of history, and the sheer amazement that they exist – so it's also their rarity. I mean, when you hold a 1921 World Series ticket and think there are only two that have ever been authenticated. Now, that doesn't mean there are only two in the world, but we don't know about others, and if there are others, we know there would only be a very few. It's the rarity of anything that intrigues people. 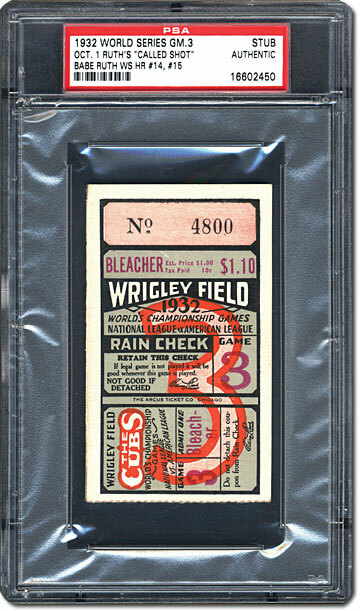 Today, especially if it is an important or memorable game, everyone is aware that the ticket is a piece of memorabilia. Tickets today are created as collectibles to be saved. They are durable, never ripped – just scanned. But back in the 1920s, no one ever thought that the ticket that was quickly ripped in half and handed back to them and then stuck in their pocket would ever have any value. So, it's the rarity, and, for me, it is also the connection to the past event and player. When I hold a ticket from that game, it is as close as I, or anyone else, will ever get to being at a game in which Babe Ruth played. You get a little sense of the feeling the person had who used the ticket to go to that game. SMR: It really is amazing to have a tangible item from a game in which all the participants have passed on and even the stadiums where they played are gone. RL: I look at some of these old tickets, that gave admittance to the Polo Grounds, which of course, doesn't exist any longer, and yet here are these tickets – in very good condition! The stadium – the bricks and mortar and steel – that's gone, and yet, the most fragile thing, printed on thin paper still exists – it's just remarkable to me. SMR: Some say each one of them tells its own little tale. That's true isn't it? RL: That's exactly right. Think about that first All-Star Game ticket. That ticket is just amazing. When you look at it, you get such a sense of history as to where it was played and the sense of the economics of the time. As you look at tickets from different eras – the 1920s, '30s, 40s – you see how they were printed, the type of paper they were printed on and how much it cost to purchase the ticket. They all do tell a story. You think about the role baseball plays in people's lives. You think of 9/11, when New Yorkers were just traumatized, and then the Yankees got to the World Series and it gave people the chance to unify and forget their pain for a moment. Baseball has done that so many times in our country's history – during wars and depressions. It has lifted up the country's spirit. When I look at those old tickets, I think of what was going on in the country and the world that year. You wonder what the person who attended that game was thinking, or going through in their personal life, no matter what was going on, that they were at a game watching Babe Ruth play. Back then, baseball was what it has always been – and continues to be today – an opportunity to escape from troubles and to unify with others who come from very different backgrounds. None of our differences matter within a baseball stadium because everyone is united around watching the players we love and cheering on the teams we follow. SMR: Of the things you collect, are there some that have a stronger emotional hold on you than others. You know, the standard question – any favorites? RL: (laughs) I really love Yankees and Babe Ruth memorabilia. I'm just fascinated with anything associated them – tickets, autographs – any sort of interesting item that would be a connection to them and their history. In my opinion, I don't think there has ever been a sports figure that has done more for baseball, and sports in general, than Ruth. Not only was he an incredible player and character, he had an incredible life story. 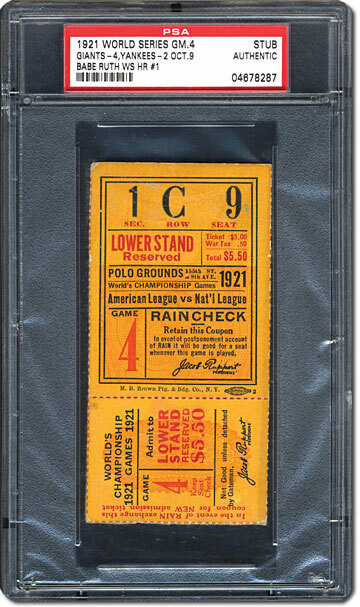 I have a 1923 World Series Game Six ticket – a game in which Ruth homered – that has been signed on the back by Ruth. When I look at that signed ticket, so much goes through my mind. Who was the person who got him to sign it and where was it signed? Batting practice? After the game? Did he say anything? When I look at it, I feel like I am there with that person. I also have a contract that Ruth signed that gave him five percent of the proceeds from the film "The Babe Ruth Story." He was very sick when he went to the premiere of that film – he was dead three weeks later. So, you can image what it took for him to be there. There has never been a figure to excite the imagination of the country like Ruth. He really was larger than life. Lou Gehrig was a quiet guy. Mantle and, of course, DiMaggio were not big public figures. Ruth was super-sized in who he was and in everything he did. Years later, Muhammad Ali was the only other sports figure to really capture the world's attention in a similar way, but the Babe was number one. SMR: Some collectors are emotionally attached to the things they collect, others are investors or presenters. Where do you see yourself? RL: I don't display things, so I'm not a presenter. I'm also not the kind of person who collects things and then just sits on them forever. I am conscientious of the money aspect insomuch as that it is only by making a wise buy and then selling it that I can turn around and get something else. I'm not independently wealthy, so I have to sell something to buy something else. I also love to trade with other collectors. I am mostly just fascinated with these things that have historical significance, but I also enjoy interacting with people in the hobby that I have built relationships with. SMR: You and Gina have been married for 27 years, what are her feelings about your collection? RL: She sees how much pleasure I get from these things. She also trusts me. She knows I am cautious and responsible. I've been extremely impressed by how sports collectibles have held their value, and even increased in value, during all kinds of markets and economic downturns. As I said, I don't buy something primarily for the investment value, but I think everyone who purchases a collectible does think about its intrinsic value. For me, I have always tried to get as good of an example of an item as I can. I am a big believer that if you buy quality in the things you are interested in, you will find there are other people who are interested in the same things and will appreciate the quality. I believe there will always be an interest and demand for high quality, rare and unique sports collectibles – for their value and for the emotional connection and love people have for them.